The Hillsborough County Sheriff’s Office praised a heroic Hooters Restaurant manager Wednesday for coming to the aid of two deputies struggling to subdue an unruly customer. 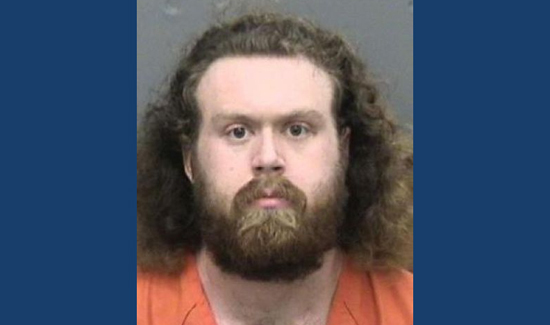 Jim Nolte, manager of the Brandon Hooters on East Adamo Drive, called sheriff’s deputies to his restaurant on August 13 to trespass 23-year-old customer Ashton B. Toney (pictured above). Toney, of Valrico, had become belligerent and threatened to kill an employee after staff at the Hooters refused to serve him alcohol and asked him to leave the property, the sheriff’s office said. The restaurant’s surveillance video captured the violent confrontation that ensued after two uniformed sheriff’s deputies arrived. Nolte met the deputies in the entrance way of the restaurant and was talking with them when Toney, who appears to be following a female employee, walked through the entrance way and confront the group. The video shows Deputy Niki Tejada, 33, pointing at Toney just before he slaps her hand away and begins pushing and throwing punches at Tejada and her partner, Deputy Andrew Glassman, 26. Nolte, 40, immediately joined the scuffle, struggling with the deputies for several seconds before the three overpowered Toney enough to restrain him on the ground. It was only with Nolte’s help, the Sheriff’s Office said, that Toney was taken into custody on two charges of battery on a law enforcement officer and a charge of resisting arrest with violence. He was booked into the county jail without further incident and released Wednesday on $6,000 bond.